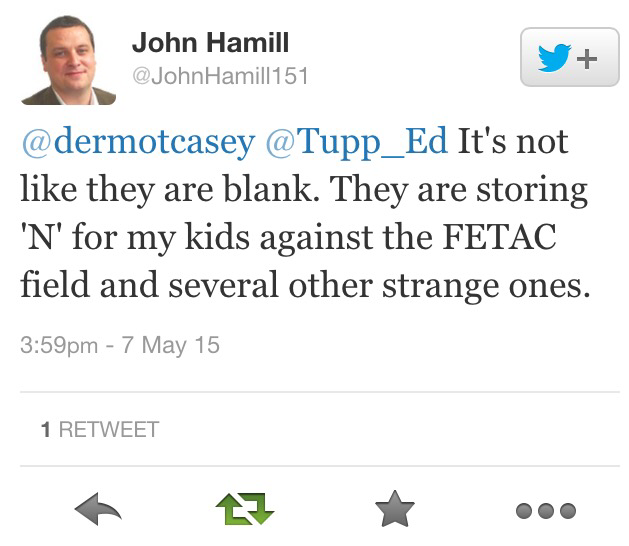 Tweeter @johnhamill151 FOI’d his children’s data from POD and yesterday published what he got back. To his surprise, he discovered the Department was storing data in POD on his kids which was completely unrelated to their primary school education and data of a sort he had never been aware would be collected or stored. These fields included data on children’s special needs assessments such as “GAM_MILD_OR_BRDRLINE_MILD_GLD” or “GAM_SPECIFIC_LEARN_DISABILITY”. The Department continues to insist that this does not constitute Sensitive Personal Data. They desperately want to claim that because such data will require parent’s consent to be collected. The new Circular governing POD has not changed this miscatagorisation. I don’t think one could draw a conclusion that those in receipt of EAL have a physical or mental health condition…The questions measure receipt of special educational supports and nothing else. In the face of this evidence of actual medical diagnostic data (mild, borderline mild, specific learning disability) being collected and stored, I don’t think that this is a sustainable defence of this illegal processing of sensitive personal data. The purpose of the primary online database-according to the department- is to assist with the statistical analysis of the population of primary schools. Unfortunately it appears that the department has decided to collect a series of fields in relation to children that have nothing to do with their primary school education. These fields include data on leaving certificate subjects, data on Junior Cert subjects, data on FETAC courses and even data on whether primary school children are sitting the leaving cert applied exams (Hint: no, they’re not). After the unfortunate business of the first POD Circular’s efforts erase all non-White options for Irishness, by carefully removing them from the CSO’s list of cultural backgrounds, you might think that the Department of Education might be a bit more sensitive as to ethnic and cultural indicator data it collects and stores on children. This is, after all, one of only two forms of data it will admit to being Sensitive Personal Data. 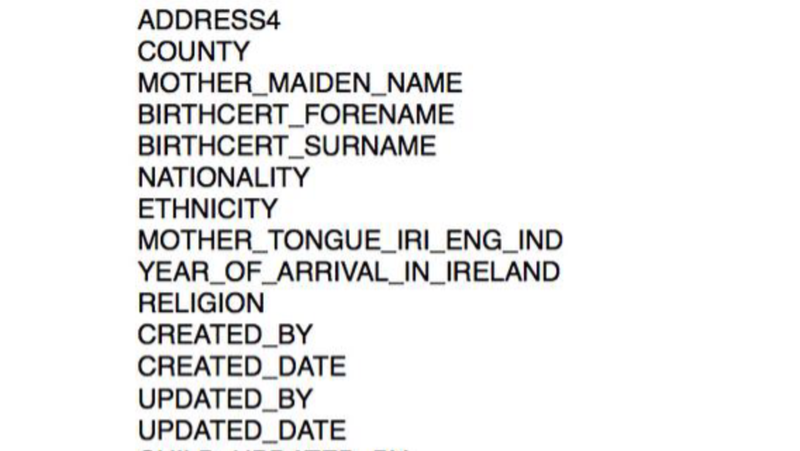 Sadly, it appears that there are still fields in the POD database for “MOTHER_TOUNGE_IRI_ENG_IND” and most mysteriously “YEAR_OF_ARRIVAL_IN_IRELAND” which will presumably be the same as date of birth for most children. 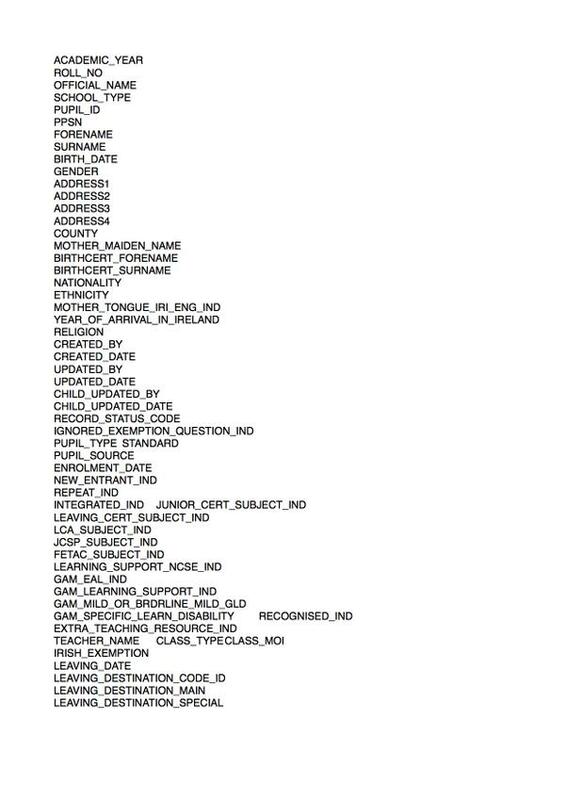 It is rather difficult not to think that any data entered against either or both field, neither of which were part of the usual consent form supplied to parents, could be used as a marker of ‘foreignness’, in case the parents withheld consent for data under the “ETHNICITY” field to be collected. It’s very unclear as to what it is for, but it does seem like a strange decision to have a data field labelled “IGNORED_EXEMPTION_QUESTION_IND”. If you have asked to be exempted from the database, what, exactly is being ignored? The full set of data fields disclosed is below. Simon … Many moons ago you published a post of mine called ‘A Room of his own’ – is that still recoverable? I seem to have lost my copies!